Hello Readers, Today Mi India and Flipkart is again back with a new Mobile Phone i.e. their Redmi 3s And 3s Prime Smartphone. It’s a great budget phone with 16gb Rom And 2 GB RAM / 32Gb Rom and 2gb Ram Variants. These smartphones have some great feature at just at the Starting price of Rs.6999. These Mobile Phone had launcjed on 3 August 2016 In India. Today Mi India and Flipkart is Doing a Flase Sale For Redmi 3s and Redmi 3s Prime On Flipkart and Mi India official mobile App. Hurry Up and Grab It….. Note ( Before Ordering ) – Redmi 3s I.e. 16gb Variants costing Rs.7,999 has no Fingerprint Sender but Redmi 3s Prime Costing Rs.8,999 has Fingerprint Sensor. How to Buy Redmi 3s & Redmi 3s Prime On Flash Sale ? 2. Search For Mi 3s / Mi 3s Prime. 3. Select the Color / Variant. 4. Hit the Coming Soon Button. 5. You will be redirected to Flash Sale Page with running timer. 6. When the timer Ends, You will see the Add to Cart button just tap on it. 7. Than Proceed to payment and place order. 1. Visit Flipkart Mobile App / Website. 2. 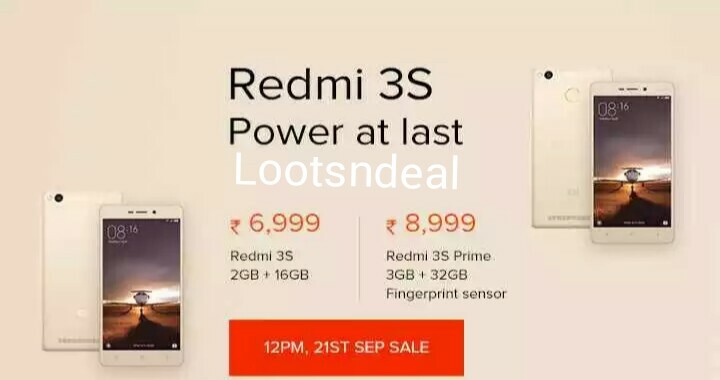 Search For Redmi 3s / Redmi 3s Prime. 3. At Sharp 12 Pm, Add the Product to Cart. Note – Sometimes Flipkart Start Their Sale At Before 12 pm. So keep an eye on products from 11:40 Am to did not miss the deal. 4. Proceed to Checkout and Order It. 5. That’s It, You will get you product shortly. Note – If you had not able to order it at 12 pm and it is showing Out Of Stock. Than do not loose hope as Flipkart is continuing it’s sale till 1-2 hours just keep refreshing product page the Product will come in Stock in short interval of times for 1-2 seconds till 2 Pm.